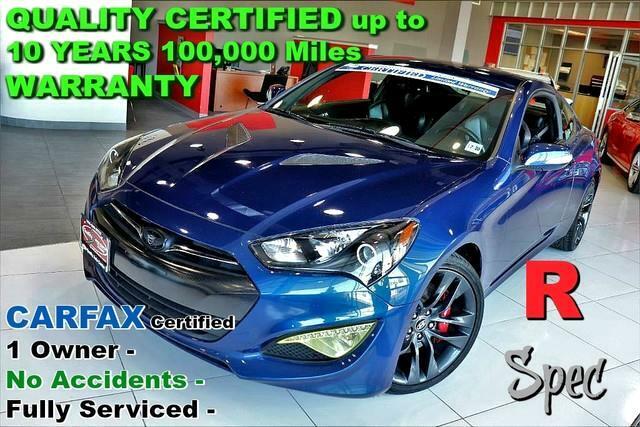 CARFAX Certified 1 Owner - No Accidents - Fully Serviced - QUALITY CERTIFIED up to 10 YEARS 100,000 Miles WARRANTY Genesis Coupe 3.8L R-Spec only has 26,614mi This Hyundai includes: REAR LIP SPOILER (PIO) Rear Spoiler CARGO NET (PIO) IBIZA BLUE BLACK/BLACK, LEATHER BOLSTER/CLOTH INSERT SEATING SURFACES Cloth Seats Leather Seats *Note - For third party subscriptions or services, please contact the dealer for more information. * This well-maintained Hyundai Genesis Coupe 3.8L R-Spec comes complete with a CARFAX one-owner history report. This vehicle has extremely low mileage on the odometer, so while it's pre-owned, it's practically new. Added comfort with contemporary style is the leather interior to heighten the quality and craftsmanship for the Hyundai Genesis Coupe With complete records on this pre-owned vehicle, you'll have peace of mind and the satisfaction in knowing your new purchase is safe and reliable. Looking for a Hyundai Genesis Coupe that is in great condition inside and out? Take a look at this beauty. The 2015 Hyundai Genesis Coupe is built with pure muscle. Punch the throttle and feel the power of its torque and horsepower plant you firmly to the back of the seat. New tires are just one more reason this vehicle is a great deal. There is no evidence of prior damage or paintwork on this Hyundai Genesis Coupe 3.8L R-Spec. This extremely hard to find Hyundai Genesis Coupe has made its way into our dealership. This Hyundai is equipped with some of the most amazing wheels the market has to offer! Once you take this Hyundai Genesis Coupe 3.8L R-Spec for a test drive, you'll immediately realize how much of an added bonus this vehicle's upgraded wheels will provide. More information about the 2015 Hyundai Genesis Coupe: There is a lot to like about the Hyundai Genesis Coupe. Modern styling, a very powerful V6 engine and an available 8-speed transmission make a sporty, but everyday drivable combination. Starting at just under $27,000, the Genesis Coupe presents a package that offers an awful lot of performance for not a lot of money. The R-Spec model adds in sport-tuned suspension and a limited-slip differential turning the Genesis into a potent track-ready racer, with pricing still below $30k. Strengths of this model include excellent road-holding, Fresh styling inside and out, 8-speed automatic transmission, and superior warranty No Credit / Bad Credit / No Paystubs, No problem !! ! All Approved ! Everyone drives ! CLEAN, GORGEOUS, LOW MILES, SHOWROOM CONDITION. CALL NOW QUALITY CERTIFIED up to 10 YEARS 100,000 MILE WARRANTY , To Certify a vehicle, there will be an additional cost for Certification. CALL NOW For details. STUNNING AGGRESSIVE LOOK ON THIS BEAUTIFUL--Call today to schedule a test drive... Good Credit/Bad Credit/No problem!!!! Get paid cash? No problem!! 100% Credit Approval with interest rates starting at 2.49% for qualified customers, our rates will not be beaten. We price our cars at wholesale price to guarantee the best deals for our customers. Our inventory moves quick, please call to confirm the availability of the vehicle of your interest Springfield location 973-564-0112. This vehicle is located at our SPRINGFIELD location. Come visit our new showroom in Springfield NJ. Contact Quality Auto Center today for information on dozens of vehicles like this 2015 Hyundai Genesis Coupe 3.8L R-Spec. This low mileage Hyundai Genesis Coupe has barely been touched. It's the next best thing to buying new. The quintessential Hyundai -- This Hyundai Genesis Coupe 3.8L R-Spec speaks volumes about its owner, about uncompromising individuality, a passion for driving and standards far above the ordinary. You've found the one you've been looking for. Your dream car. More information about the 2015 Hyundai Genesis Coupe: There is a lot to like about the Hyundai Genesis Coupe. Modern styling, a very powerful V6 engine and an available 8-speed transmission make a sporty, but everyday drivable combination. Starting at just under $27,000, the Genesis Coupe presents a package that offers an awful lot of performance for not a lot of money. The R-Spec model adds in sport-tuned suspension and a limited-slip differential turning the Genesis into a potent track-ready racer, with pricing still below $30k. Interesting features of this model are excellent road-holding, Fresh styling inside and out, 8-speed automatic transmission, and superior warranty No Credit / Bad Credit / No Paystubs, No problem !! ! All Approved ! Everyone drives ! CLEAN, GORGEOUS, LOW MILES, SHOWROOM CONDITION. CALL NOW QUALITY CERTIFIED up to 10 YEARS 100,000 MILE WARRANTY , To Certify a vehicle, there will be an additional cost for Certification. CALL NOW For details. STUNNING AGGRESSIVE LOOK ON THIS BEAUTIFUL--Call today to schedule a test drive... Good Credit/Bad Credit/No problem!!!! Get paid cash? No problem!! 100% Credit Approval with interest rates starting at 2.49% for qualified customers, our rates will not be beaten. We price our cars at wholesale price to guarantee the best deals for our customers. Our inventory moves quick, please call to confirm the availability of the vehicle of your interest Springfield location 973-564-0112. This vehicle is located at our SPRINGFIELD location. Come visit our new showroom in Springfield NJ.